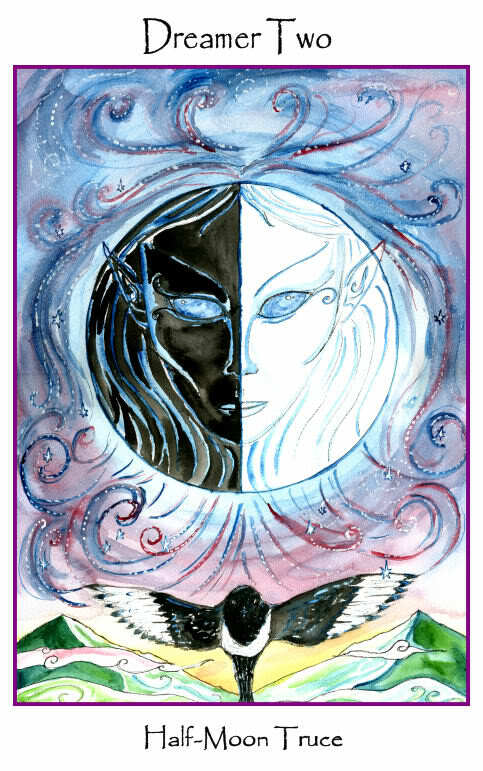 Weekend Reading: Dreamer Two/Half Moon Truce from the Tarot of the Sidhe. Don't be surprised if you find your mind split in two this weekend....or find yourself on one side of two conflicting visions. One option is to just take a time out and stall any decision until after the weekend. Another is to try to assess your choices from the big-picture perspective. Or you could see if there's a truce or compromise you can make. If it's really not worth arguing about—or if both options are winners—then don't sweat it. Just be grateful you're in such a fortuitous situation. But if your decision has anything to do with whether or not to take a risk in this weekend's storms or something like that, err on the safe side, fercryinoutloud!